Thousands of businesses use Trello to organize their projects and work with perspective. These businesses trust Trello to reliably store their files and provide secure access to their company data. 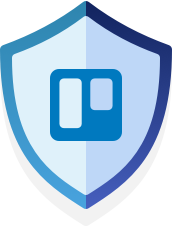 For details on the services, policies, processes, and procedures that have been put in place to make Trello a secure and reliable service for all of our users, please see the Operations and Security Page. Trello respects all laws that apply to our business, including GDPR. Trello appreciates that customers have rights under GDPR and we are committed to respecting those rights, including the Right to Be Forgotten. We work to keep Trello available 100% of the time, and Trello experienced 99.99% uptime in 2018. Trello's availability is published in real-time at www.trellostatus.com, where you can also find our incident history. Please submit your report on BugCrowd and our security team will respond as soon as possible.